The Vikings invested heavily into their starting defensive line this offseason, extending Danielle Hunter’s contract with $40 million guaranteed and signing Sheldon Richardson to a one-year, $8 million deal. Still, head coach Mike Zimmer wants to get his starters a little more help through a deeper rotation in 2018. 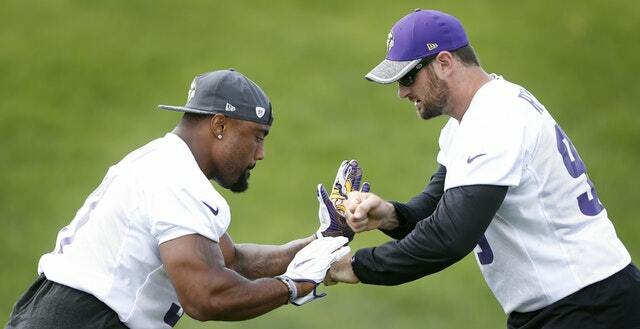 It just so turns out team captain Everson Griffen, who is 21st among active leaders with 61 career sacks, is O.K. with that. Griffen participated in Saturday’s morning walkthrough, his first session since being held out this spring due to a minor knee injury. Griffen set an All-Pro pace last season with 10 sacks in the first half of the schedule. He tied Jim Marshall and Jared Allen for the franchise record of eight straight games with at least one sack. Griffen’s run came to an end, in part, because of a torn plantar fascia suffered in that Week 8 win against Cleveland. He played 92 percent of the snaps in that game. Overall, Griffen led the Vikings defensive line by playing 79.7 percent of the snaps. That’s in spite of sitting out Week 10 in Washington due to his foot injury. His playing time lessened slightly after the injury. Now the Vikings are looking to get ahead of attrition with more hands on deck in 2018.
Who will step up? Brian Robison is the primary rotational end, but he turned 35 in April and might not be relied upon as much after playing more than half of the defense’s snaps last year. The Vikings have an intriguing cupboard of unproven defensive linemen, starting with defensive ends Stephen Weatherly and Tashawn Bower, as well as defensive tackle Jaleel Johnson.